Uniquely Scotland was founded in 2013 by Archie Stirling-Aird. We are located in Central Scotland, next to the historic town of Dunblane. Our emphasis is on quality not quantity and we aim to give our clients a true taste of Scotland and its culture utilising our excellent local knowledge and contacts, as well as our passion for Scotland. Whilst we will help you put together your holiday package and itinerary, putting forward suggestions based on your interests and requirements, our product will enable you to explore Scotland at your own pace with the freedom to act spontaneously and pick and choose what you want to do which we believe is how a holiday should be. We hope that you will return from your holiday in Scotland feeling refreshed and enriched by the experience. A former driver guide and qualified rural surveyor, Archie is from a rural background and was born and brought up in Scotland. He has worked as a driver guide with another well known tour operator and has previously worked in land managemnt on a number of Highland and Lowland estates. Archie is a keen bagpiper (often taking his pipes with him on tour! 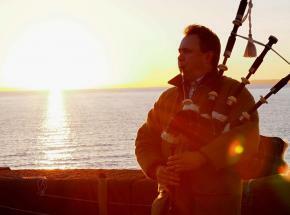 ), and plays at various events including weddings, and has a passion for Scotland and its stunning and dramatic landscape. 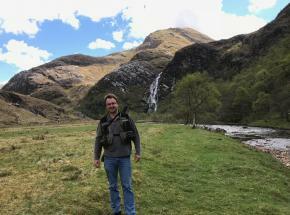 He is also a keen fly fisherman and hill walker and loves nothing more than being out fishing on a highland river. Mark Allan joined US at the start of 2017 and brings with him a huge passion for Scottish culture, history and heritage. Originally hailing from Inverness, the Capital of the Highlands he has travelled extensively across Scotland and spent many of his formative years sailing and exploring the north-west coast on his families sailing boat. A keen mountain biker and outdoorsman Mark embodies our moto, Explore, Embrace, Live, Learn. He loves nothing more than meeting new people, exploring and embracing wild Scotland. Adventure is never far away and he even recently tried caving! Feel free to browse our website and get some holiday ideas, all of which can be tailored to suit you, and we will happily answer any questions you may have in relation to your holiday requirements. Please contact us for more information. Towergate Chapman Stevens through Zurich Insurance PLC provide protection under the Package Travel, Package Holidays and Package Tours Regulations 1992 for Uniquely Scotland. Mark itineray planning for next season!